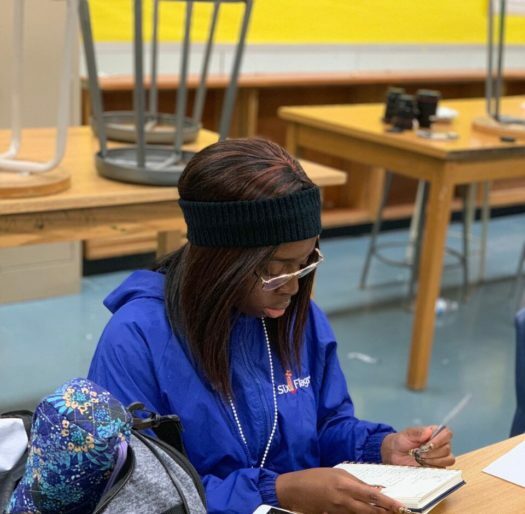 Sophomore Precious Agary writes during a free-writing activity in "Her Truth." “Her Truth” is an all-girl creative writing club at Parkdale, where girls meet up to write, talk, and do activities in a safe environment. The activities in the club are usually eye-opening activities that show participants that we all have relatable experiences but also different in our own ways. The privilege activity was an eye-opener for many participants. The activity did not solely include discussion but interactive demonstrations, as well. Participants were asked a series of questions where they would take a step forward if they had experienced the situation. The questions asked were common that at least everyone can relate too, including “If you skipped a meal because there was nothing to eat at home”, “If your parents own a car”, “If your parents went to college”, and “If you had any disabilities”. It served as an eye-opener to many girls who either experienced this situations or learned their friends and classmates had. All of this couldn’t be done without the help of Shamari Pratt, the founder of “Her Truth”. She had many struggles when trying to start the club, ranging from starting the non-profit club to being the one to start. Not only did she have problems with starting the groups, but she also had doubts about herself. The environment of the club is a safe one, where no one judges each other and tries to help each other. The club is where students can not only write to express themselves but interact with each other, as well. The club serves to empower young girls to feel that they are more than what everyone says. This club builds self-confidence and gives them a safe space to let them be themselves.